The sport of professional boxing is poised to become a major market after the United States Supreme Court struck down a 25-year federal ban on sports gambling earlier this year. Despite persistent storylines from the mainstream media that boxing is a dead or dying sport, pay-per-view (PPV) data gathered from boxing’s biggest events since 1990 indicates the sport is not only resisting any so-called decline in popularity among the American sports public, but potentially even growing. Boxing - not MMA or WWE - has long been the pay-per-view king of combat sports. Its biggest promotions consistently have higher buy rates than any other combat sport while at the same time enjoying less mainstream coverage than either of its rivals. While the WWE has since abandoned the PPV model in favor of a monthly subscription alternative, the WWE network, boxing’s hold as the PPV model’s top dog was never really challenged by either the WWE or MMA when all three were actively competing for viewership. And despite the growth of MMA over the last decade, things don’t appear to be headed that way in the near future. According to Business Insider’s list of the 51 best-selling PPV fight events events in history, boxing holds 8 out of the top 10 spots, while also making up the largest total volume of events overall at 27. Over the same timeframe, MMA followed at 15 events on the list with WWE coming in third at 9. While it’s become the norm for media entities to insist less people today are showing interest in watching professional boxing, the claim often comes with no data in support of it, mostly relying on the general feeling one might conceive after watching ESPN’s SportsCenter or other mainstream sports shows that willfully ignore the sport. Despite the inaccurate and repetitive obituaries for the sport, the actual number of people who are willing purchase boxing PPVs has increased greatly over the last 30 years. Moreover, a close inspection of the overall buy rates since 1990 for boxing’s biggest events (i.e. 1 million buys or more) juxtaposed to the U.S. population growth over the same timeframe indicates boxing’s core PPV audience is actually growing in terms of both the raw number of people willing to spend their money on a big fight PPV as well as the overall percentage of an ever expanding U.S. population. And while the U.S. population has grown substantially since 1990 from 279.04 million to 325.17 million in 2017, the percent of the American public willing to buy boxing PPVs has also grown. Since 1990, the core boxing PPV audience, according to the data, is 0.54% of the population. But since 2010, that percentage has increased to 0.58%. According to the data, that means the number of people potentially willing to purchase the right PPV matchup (e.g. the biggest and best fights between elite stars) is between 1.7 and 1.9 million. Additionally, the highest percentages of the U.S. population to purchase a PPV to watch boxing on TV does not come from fights between the likes of the previous generation of stars, such as Mike Tyson, Lennox Lewis and Evander Holyfield. Instead, the highest percentage, and remember that percentage is of a much larger number, was in support of recent box-office stars Floyd Mayweather and Manny Pacquiao. “I really think the kind of business that’s going to be done now with legal sports gambling is going to be absolutely tremendous,” said boxing promoter Bob Arum. Arum, perhaps the most successful and powerful boxing promoter the world has ever known, has long profited from positioning his biggest and best fights in Las Vegas where sports gambling was already a legal enterprise. 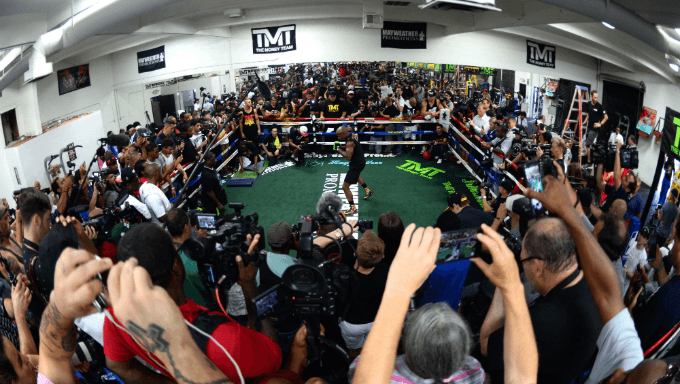 How might a larger number of people across the United States being given legal access to sports gambling affect boxing’s already growing fanbase? Is boxing poised to become a major market player? Rutowski said boxing has already proved among television network executives to have a very diverse audience that can produce impressive numbers in lots of sought after demographics including the highly-coveted group of younger viewers. He said the prolonged impact of more ways people can enjoy the fights might one day make the boxing betting market a major one in the U.S., pointing to boxing’s hulking culture across the pond as reasonable evidence. While the U.S. has essentially just opened for business for the legal sports gambling market, people in the U.K. have long enjoyed its benefits. Boxing isn’t dead. It’s not suffered a knockdown and it’s not ever really been staggered in terms of growth over the last 30 years. If anything, the sport’s fanbase is growing stronger and stronger.